The features available on iTunes have developed a lot over recent years. One thing that has become more popular is the ability to create a playlist. Of course, there are several reasons for this. Firstly, if you are having a party then the last thing that you want to be doing is getting up and down every five minutes to change the track. This is where a playlist comes in handy. However, how do you know what songs to put in a playlist? You want music that compliments each other and music that will set the tone for the party. This is where the ‘Genius’ feature on iTunes comes in handy, and more and more people are making use of it every day. Basically, the ‘Genius’ feature will create a playlist of songs that go with each other. For example, it will compile a list of dance tracks, or a playlist of rock tracks. This is great if you want songs that complement each other. Let’s take a look at how it works. First, take a look at the left hand side of the iTunes screen and click on the ‘Genius’ tab. It will then present you with this page. You have to sign in with your Apple ID and then you will be presented with this screen. You will notice that there are three steps that have to be completed in order for the genius feature to be activated. Once the process has been completed, you will see that Genius has been turned on. Okay, so now we have activated the ‘Genius’ feature, it is time to start creating playlist. What we have to do is select a song and then click on the genius button at the bottom of the page. You can alternatively right-click a song and select Start Genius from the context menu. When this is done we just have to wait for the results. 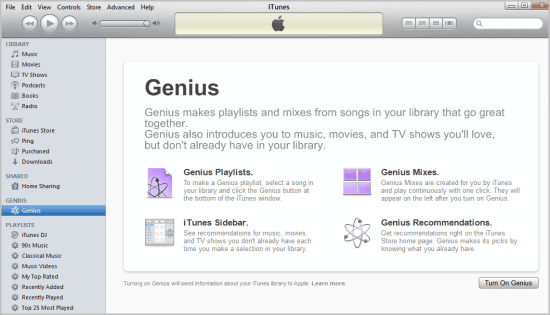 The Genius feature populates a playlist based on the selected song. The Genius Mixes feature searches your iTunes library to find songs that go great together, then organizes them into mixes you’ll love. These mixes are like channels programmed entirely with your music. Under Genius, click Genius Mixes. You’ll see Genius Mixes that have been created for you. Click one to play. Rearrange and rename the mixes you want to keep, and delete the ones you don’t. Based on the song Play with fire by The Rolling Stones, we now have a whole playlist created. Included in the playlist are songs from The Byrds, The Who, The Doors, Pink Floyd, Dire Straits and Nirvana. The selection depends largely on the available songs in your library. As you can see, this is a very easy feature to use, and also a very useful one to have available. If this is not the sort of thing that you are looking for, then it is a good idea to take a look at the iTunes DJ feature. This feature creates a continuous mix of songs based on your library. 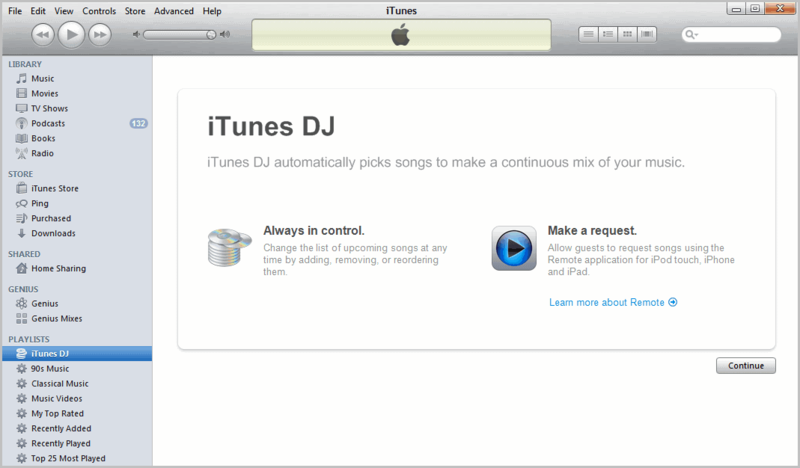 Let’s take a look, first of all, we need to click on the ‘iTunes DJ’ tab one the left hand side of the page. This will then bring up the page below. The iTunes DJ feature automatically picks songs from your entire library or from a specific playlist to create an endless mix of music. Review upcoming songs to reorder or remove on the fly, or add songs to the playlist at any time. The core difference in functionality between the genius and dj feature is that genius tries to find matching songs for the playlist, while dj adds a random selection of songs to a playlist. Privacy conscious users on the other hand may not like the fact that library information are transferred to Apple if the Genius feature is activated. conscious users on the other hand may not like the fact that library information are transferred to Apple if the Genius feature is activated. Musicbee implements last.fm data to make auto playlist based on your initial track, and does a fine job of it too. ’tis is sad state when someone has to let a computer program decide what music they are going to listen to…. If you have a large library, these are great features. I have 1600 cds on my laptop and discover “new” stuff all the time with genius.